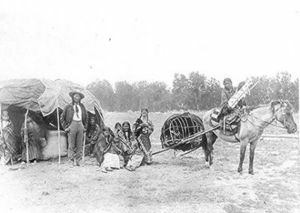 Cheyenne family using a horse-drawn travois, 1890. A travois (Canadian French, from French travail, a frame for restraining horses; also obsolete travoy or travoise) is a historical frame structure that was used by indigenous peoples, notably the Plains Aboriginals of North America, to drag loads over land. There is evidence to support the thesis that travois were used in other parts of the world before the invention of the wheel. The basic construction consists of a platform or netting mounted on two long poles, lashed in the shape of an elongated isosceles triangle; the frame was dragged with the sharply pointed end forward. Sometimes the blunt end of the frame was stabilized by a third pole bound across the two poles. The travois was dragged by hand, sometimes fitted with a shoulder harness for more efficient dragging, or dragged by dogs or horses (after the 16th-century introduction of horses by the Spanish). A travois could either be loaded by piling goods atop the bare frame and tying them in place, or by first stretching cloth or leather over the frame to hold the load to be dragged. Although considered more primitive than wheel-based forms of transport, on the type of territory where the travois was used (forest floors, soft soil, snow, etc. ), rather than roadways, wheels would have encountered difficulties which would have made them less efficient. As such the travois was employed by coureurs des bois in New France's fur trade with the Plains Tribes. It is possible for a person to transport more weight on a travois than can be carried on the back. The basic dog travois consists of two aspen or cottonwood poles notched and lashed together at one end with buffalo sinew; the other ends rest splayed apart. Cross-bars are lashed between the poles near the splayed ends, and the finished frame looks like a large letter A with extra cross-bars. The apex of the A, wrapped in buffalo skin to prevent friction burns, rests on a dog’s shoulders, while the splayed ends drag over the ground ... First Nations women both built the travois and managed the dogs, sometimes using toy travois to train the puppies. Buffalo meat and firewood were typical travois loads. "The dog travois of pre-European times was small, capable of pulling not more than 20 to 30 kg." Travel by dog travois was slower in hot weather, which is tiring for dogs. The dog travois can be seen in the paintings of Karl Bodmer. By the mid-nineteenth century, the dog travois had given way to the horse travois. When dogs were replaced by horses, the greater pulling power allowed tipis to increase in size and household goods to multiply." After horses were introduced to North America, many Plains Indian tribes began to make larger horse-drawn travois. Instead of making specially constructed travois sleds, they would simply cross a pair of tepee poles across the horse's back and attach a burden platform between the poles behind the horse. This served two purposes at once, as the horses could then simultaneously carry the tepee poles and some additional baggage. Horses, of course, could pull much greater weight than dogs. Children often rode in the back of horse travois. When traveling with a travois, it was traditional for Salish people to leave the tipi poles behind at the camp "for use by the next tribe or family to camp there." A horse travois can be made with either A-frame or H-frame construction. What today is known as the Lewis and Clark Trail-Travois Road, and Montana's Lewis and Clark Pass were areas heavily traveled where travois "were dragged over the trail, causing deep, parallel tracks to mark the earth," which are still visible today. Remains of travois tracks can also be seen at the Knife River Indian Villages National Historic Site. ^ Bakels, Corrie (2009). The Western European Loess Belt: Agrarian History, 5300 BC - AD 1000. Springer Science & Business Media. ISBN 9781402098406. ^ "Un Travois pour les dieux. Lac de Chalain 31ième siècle avant J.-C" (PDF). ^ "Travois". The Encyclopedia of Saskatchewan. 2006. Retrieved 2013-10-24. ^ a b Gadacz, Renee R (2012). "Travois". The Canadian Encyclopedia. Retrieved 2013-10-24. ^ Henderson, Norman (May 1994). "Replicating Dog Travois Travel on the Northern Plains". Plains Anthropologist. 39 (148): 145–159. doi:10.1080/2052546.1994.11931719. JSTOR 25669259. ^ a b "Dog Travois". Women of the Fur Trade. 2007. Retrieved 2013-10-24. ^ "Native American Travois (Indian Drag Sleds for Dogs and Horses)". native-languages.org. Retrieved 2013-10-24. ^ "Salish culture". Confederated Salish and Kootenai Tribes. Retrieved 2013-10-24. ^ Henderson, Norman. "Replicating Horse and Travois Travel" (PDF). pp. 137–147. Retrieved 2013-10-24. ^ Point, Nicholas (1967): Wilderness Kingdom. Indian Life in the Rocky Mountains: 1840-1847. The Journals and Paintings of Nicholas Point, S. J.. New York, Chicago, San Francisco. ^ Riebeth, Carolyn Reynolds (1985): J.H. Sharp among the Crow Indians, 1902-1910. Personal Memories of His Life and Friendship on the Crow Reservation in Montana. El Segundo. ^ "Lewis & Clark Trail-Travois Road--Lewis and Clark Expedition: A National Register of Historic Places Travel Itinerary". Retrieved 2013-10-24.